A couple of years ago, Nice Insight explored how the essential qualities for outsourcing relationships varied between large and midsized companies, in addition to traditional pharma companies versus biotechs. As one would imagine, these essentials differ quite a bit from emerging or start-up companies, as their needs when it comes to outsourcing are different than larger companies. Oftentimes the company is too new to the industry to have a well-established process for selecting providers, or a track record of what has worked well in the past. To further complicate matters, is not uncommon for senior leadership at start-up companies to have a history at a Big Pharma or biotech and to be brought on for their expertise — which is a strong positive in many aspects of running a successful business, but not necessarily in finding the right type of outsourcing partner. Folks in the biopharmaceutical industry know that identifying which qualities make the greatest contribution towards a positive relationship with an outsourcing partner is an ongoing and ever-changing process. The fluid nature of the drug development industry – one that is constantly adapting to new health challenges, technologies and regulatory legislature – is part of what makes it so difficult to outline which attributes in a contract manufacturer should be prioritized so that the relationship functions like a strategic partnership where both the buyer and CMO benefit. The continual transformation of drug development reiterates the importance of keeping an open mind and learning from the successes of one’s industry peers. That way, the pressure to find the right business for a project diminishes and is replaced by confidence in finding a company with the right mix of attributes that will make for a successful long-term partnership. 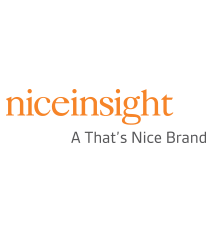 Nice Insight reviewed the outsourcing behaviors and strategic partnering preferences from respondents who work at emerging / niche or start-up pharmaceutical companies and those who work at emerging or virtual biotechs to see how these smaller businesses identify CMOs and develop mutually beneficial relationships. Starting with the methods used to identify potential outsourcing partners, the practices of emerging pharma companies and emerging biotechs differ. Emerging pharma relies on referrals from colleagues as their main resource (60 percent), whereas emerging biotechs use industry research to identify potential CMOs (62 percent). Emerging pharma companies are more likely to seek out advice from consultants on outsourcing (56 percent as compared to 51 percent of emerging biotechs). While emerging biotechs are more likely to seek out suppliers at trade shows than emerging pharma companies (53 percent vs. 39 percent). The primary reason for engaging contract manufacturers was consistent between emerging pharma, Big Pharma and Biotech companies — improving quality — however, among emerging biotech respondents, this trait came in second after improving time to market. It is no surprise that cost savings is a key factor in outsourcing. Whether it is decreasing fixed costs or capital investment, reducing financial outlay proved important among established and emerging companies and for both traditional pharma and biotechs. Interesting areas where outsourcing motivations diverged between emerging companies is the desire to gain operational expertise; prioritized fourth among emerging pharma companies, and ranked eighth among emerging biotech companies. Mitigating supply chain risk carried greater important among emerging pharma companies than among emerging biotechs (5th position vs. 10th). Conversely, emerging biotech companies ranked general process improvement much higher than emerging pharma (6th position vs. 10th). When it comes to selecting a CMO, the number one factor for both emerging pharma companies and emerging biotechs is experience. Experience is one of two common rankings between these two buyer groups, the other being “risk sharing opportunities” in fifth position. 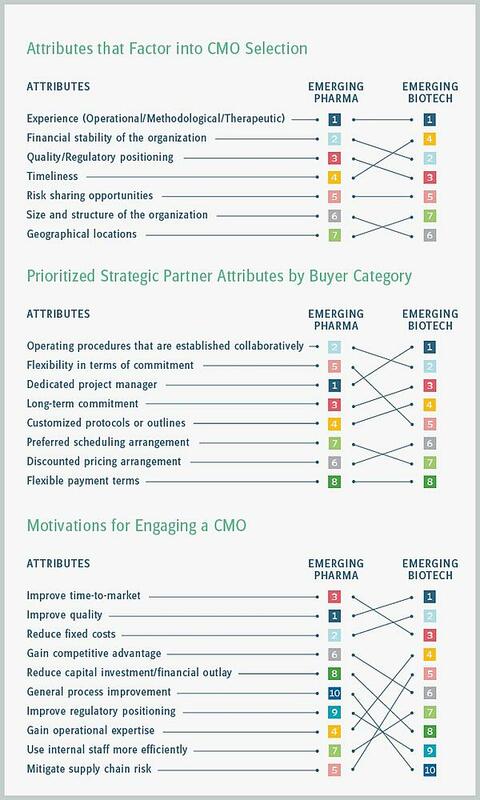 Emerging pharma placed the CMO’s financial stability over quality and timeliness (3rd and 4th, respectively), whereas emerging biotechs ranked financial stability after those merits, identifying quality/regulatory positioning as their second priority followed by timeliness. Neither emerging pharmas nor emerging biotechs placed much importance on the size and structure of the CMO, it’s geographical location. As a contract manufacturer, this knowledge should be applied to pitch the right company strengths to the relevant audience in key sales communications, which will more strategically position your business. As an emerging company, understanding how other buyers identify and prioritize CMO qualities before engaging a providers can eliminate some of the trial and error elements of vendor selection and serve as an advantage with respect to strategic decision making in outsourcing.